Happy Monday! So it was our first full weekend together since Christian has been home. We enjoyed just being home and quite a few trips to Lowe's. We started re-mulching all of our flower beds, which turned into us buying the last 15 bags of mulch at Lowe's. So currently our yard is half mulched. It looks quite funny! But if you're following me on instagram then you know I've been sharing quite a few cardigans that I am obsessing over. So I'll share all of the cardigans I have and am wearing for fall. 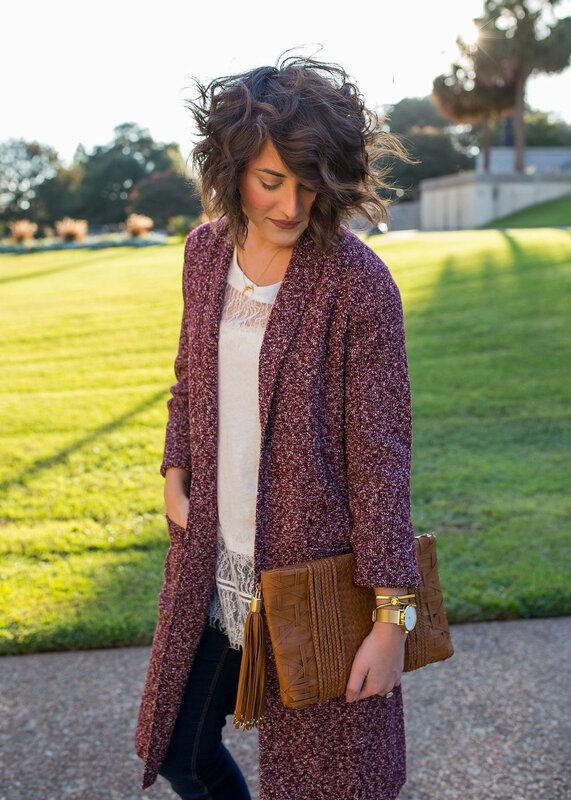 I recently started working colored cardigans into my wardrobe and this burgundy cardigan is a good one! The weight of the cardigan is perfect for layering, no matter where you're located. Since the southern falls are pretty mild, I intend on wearing it more as a jacket. I especially love the longer length. And here's another way I'd style it! I just got the dress in black and I know I'll be wearing that on repeat, too. How would you style this cardigan? Let me know below!